Matt Tavares is the illustrator of LADY LIBERTY by Doreen Rappaport; JACK AND THE BEANSTALK, retold by E. Nesbit; and ’TWAS THE NIGHT BEFORE CHRISTMAS. He lives in Ogunquit, Maine. Swashbuckling gusto and a poignant finish should make this a new favorite. Large in scale and dramatic in effect, watercolor-and-gouache paintings create believable settings, sometimes seen from unusual perspectives, and sympathetically portray the characters, especially the pirates, whose icing-sugar mouths and eyes are surprisingly expressive. 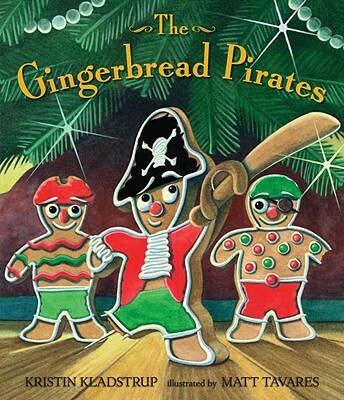 An exciting story and full-page, dramatically composed paintings depicting harrowing adventures with a mouse, a cat, and the crew imprisoned in a cookie jar make this a good holiday read-aloud. Captain Cookie’s quest to rescue his crew from their cookie-jar imprisonment is not without peril, and humorous obstacles abound…Tavares’s vivid watercolor and gouache paintings dramatize Kladstrup’s lively text with vigor in this imaginative adventure story. Cookie’s-eye-view illustrations and a story enlivened with dialogue make this boy’s version of the nutcracker sparkle. Kladstrup makes the most of the adventurous possibilities, while Tavares's sumptuous full-bleed spreads and spot illustrations play with a cookie's-eye perspective. An adventurous, hilarious story that brims with the magic of Christmas…pure delight.